There were nine absentee ballots in the Village of Dryden race, plus one affidavit ballot, and a margin of ten votes between Mary Ellen Bossack and Randy Sterling. That meant a trip to the Board of Elections this afternoon, though a somewhat more cheerful one for me than last November's. County Democratic Committee Chair Irene Stein and I were there for the Democrats, while Dryden Mayor Reba Taylor, Deb Hattery, and Mahlon Perkins were there for the Republicans. Election Commissioners Elizabeth Cree and Steve DeWitt oversaw the proceedings. 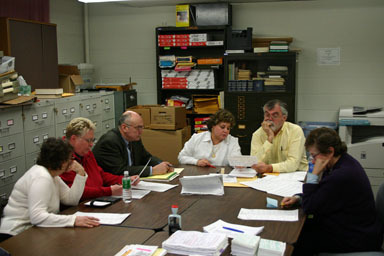 Examining a village election affidavit ballot. Nine ballots were counted today, six Republicans and three Democrats. We challenged one Republican military ballot because the sender hadn't checked which reason he had for a military ballot, but it will likely get counted in the final tally unless someone goes to court to prevent it, which I don't expect. It was the only ballot with a visible flaw. Affidavit ballots are challenged pretty routinely, but today's was filled out perfectly. The results in today's counting were 5 votes for Dan Wakeman, 5 votes for Randy Sterling, 5 votes for Mary Ellen Bossack, and 2 votes for Jim Willer. That leaves Bossack on top with 153, Wakeman in second (and still winning a seat) at 145, Sterling in third at 143, and Willer crossing into triple digits at 100. There are still a few absentee ballots out there, and they could arrive in the next few days, but there don't appear to be enough to change the winners. We'll see!